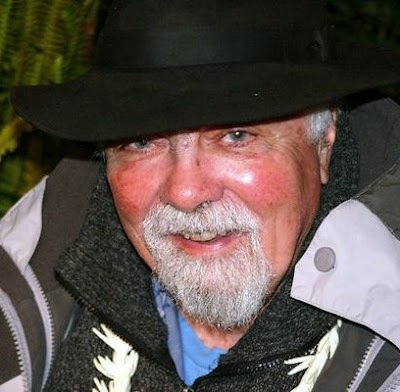 Veteran poet George Tsongas (1926-2010), a landmark in San Francisco's poetry scene, died in an acute care hospital in San Leandro, California, on January 15, 2010. He was 83 years old. Throughout his lifetime he maintained that his job as a poet was to "describe reality beyond sight." "When I first came to San Francisco in 1976 I lucked into and rented a tiny studio apartment on Telegraph Hill, three steep blocks up from Café Trieste. I immediately felt at home in what I called 'my village', which was clearly delineated and was proud and autonomous among the surrounding neighborhoods. North Beach was an Italian village and suited my European roots and aesthetic. Industrious Italian immigrants raised up their families and businesses there, held the majority of property there, lived out their senior years there. Italian was spoken and so was poetry. There was a benign coexistence between 'Little Italy' and its Bohemian enclave which incorporated iconic literary haunts like Ferlinghetti's City Lights bookstore. Poetry was as much a fact of life as were espresso and Chianti. I fast became a habitué of the passionate poetry readings at Bannam Place, the Old Spaghetti Factory and many other neighborhood hang-outs where poets held forth. These places and the faces that populated them live on in my memory. It was there that I met George Tsongas. By the time I arrived, George Tsongas, who came to San Francisco in 1945, occupied the solid position of well-known and outspoken resident poet with a sizeable following. After having had many animated conversations about poetry, people, politics and travelling, George and I struck up an easy friendship that was based on a mutual curiosity about each other's experience and point-of-view and on a strong sense of camaraderie. I came to spend much time at his Victorian flat on Harrison Street and later at his digs above Enrico's on Broadway. Over a span of 30+ years I was an intimate witness to the creation of a vast body of his work written in a unique and no-nonsense voice. He developed and stayed true to his very own style, a style that I have characterized as intuitive, succinct, condensed, and packing a punch of realism that cuts to the core and is intentionally provocative. George Tsongas' passionate interpretations of the human condition are closely aligned with my own. George would always give me typed pages, often smudged and dog-eared, of poems and bits of his manuscripts and various revisions thereof. I would always comment at length, a routine between us that he seemed to appreciate as much as I did. Ours was a relationship of trust and affection. He was at my wedding in 1983. I look at the old album: there he is, champagne glass in hand, big smile on his face, eyebrows as bushy as ever, but black with just a little grey beginning to show in the middle where his brows join. Our friendship outlasted my marriage by more than a decade. When I stepped out as a poet in my own right, I adopted the same unabashed attitude in my writing that permeates George Tsongas' work. I, like him, remain unfettered from convention, affiliation, judgment, real or perceived boundaries. I believe that it is the trademark of the poet to exercise the ultimate freedom of creative expression. Thank you, George, for having been and continuing to be a part of my life,"
have layered on his frame. with empty fluff of palate or philosophy. and all the fragrant herbs of Southern France. meticulously chiseled out on his old typewriter. This is a poet who needs no muse for inspiration. or inhumanity, as the case may be. of artifice, indignity and plagiarism. He is authentic, self-made, self-maintained, and often unapproachable. through the lines of his new poem like fingers on a keyboard. of his youthful agility of thought. and follows the dictates of his own convictions. to the proprietor of the Café, shuffles down Columbus Avenue. Ana added this footnote: The café in the poem is Café Puccini, owned by Graziano Lucchese, where George would often go to take a break. What you have shared about the history of when you first came here was very interesting to me. I didn't realize you had been here so long. I sure did enjoy reading about your friendship with George. It is easy to see how you two experienced mutual respect and understanding of each other. You have much in common. Both strong in your independence, neither of you suffer fools, and you shared an international viewpoint as well. And I do love your poem for George. Ah to the original amongst us. He reminds me of a friend I had in Alaska, a Professor and scholar who was disturbingly gruff if you weren't yourself around him. I really like the poem, it so reminds me of my Pav. This is an online Poetry Journal showcasing the life and work of polyglot poet Ana Elsner. "While spelunking in the bowels of literature, I stubbed my toe on the gnarly root of a poem, pried it loose and put it in the jar of collected inspiration on the windowsill of my mind. It soon sprouted and migrated to my neo-cortex. There it grew into a rich tissue of images and vocabulary that I tease and whittle into poems for others to stub their toe on." This is a fragment of Ana Elsner's poem Forgetting Eyes. This poem was first published in PRIVATE - INTERNATIONAL REVIEW OF PHOTOGRAPHS, Issue 40 - 'Crossing Boundaries'. Ana Elsner introduces her poetry to a nationwide audience via PEG Media and Public Access Television Channel broadcasts. All text and images © 2012 - 2014 INTERNATIONAL POET ANA ELSNER - Poetry Journal, an independent online publication.